It was with terrible sadness that I had to cancel our medical mission scheduled in February. We were to wind up the 2nd phase of midwife training with follow up training in the individual mobile communities of the nine midwives who had received training. Dr. Bob Skankey, his wife Louine, and Linda Lamb were to participate as volunteers. During the mission we would also visit the new school, check on the progress of the kids and help them plant their school garden. But it was not to be. 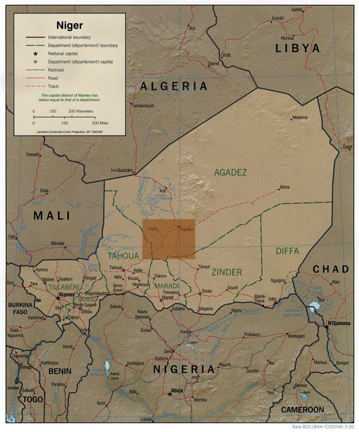 A newly launched war in Mali with the French leading the attempt to oust Islamic terrorists from the region, left security too uncertain in neighboring Niger. Because the Niger military had committed its troops and the National Guard, who usually provide our security were all committed to trying to secure the border, there was no one available to provide our security detail, which has been a necessary part of all our missions in the last three years. So our loyal volunteers paid the penalty and rescheduled their flights for next October. 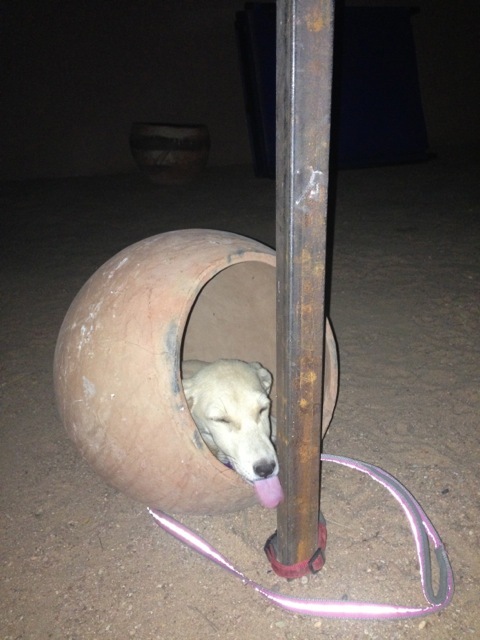 With so many projects set to begin I felt it essential to go anyway and keep a low profile so I could get bids, set up the contracts for digging a new well at the Tamesna Center for Nomadic Life and start construction of the new boarding school and do some preliminary work on our earth bag building project. So I went. Stairs to the roof terrace. 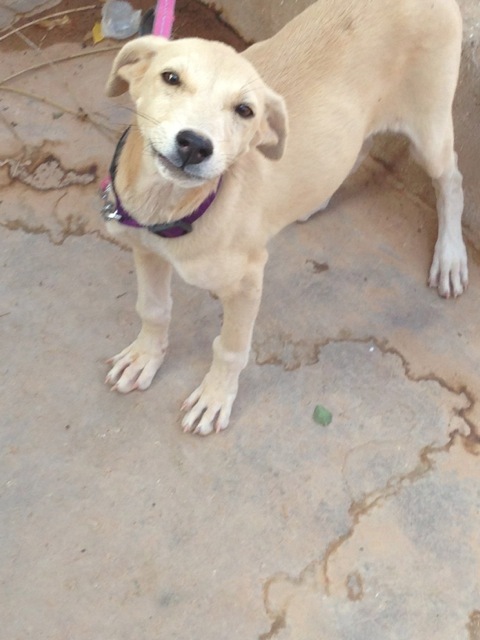 My puppy ipod has grown, but she’s still very much a puppy at about 4 months old. 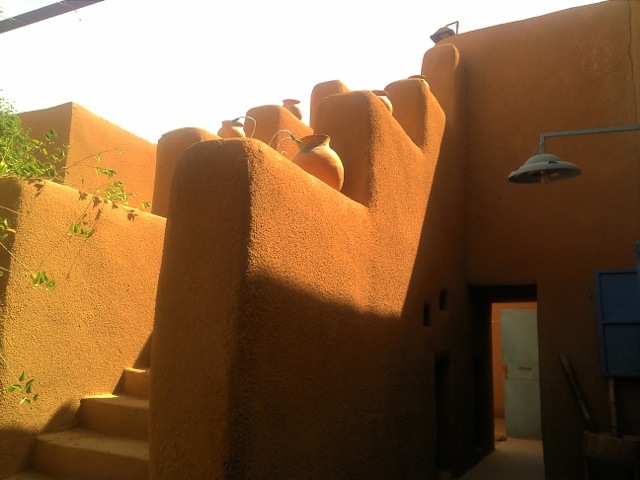 Hiding out in the house was a total pleasure for me, but my Nigerien friends decided it was an American prison–so they called it Guantanamo. 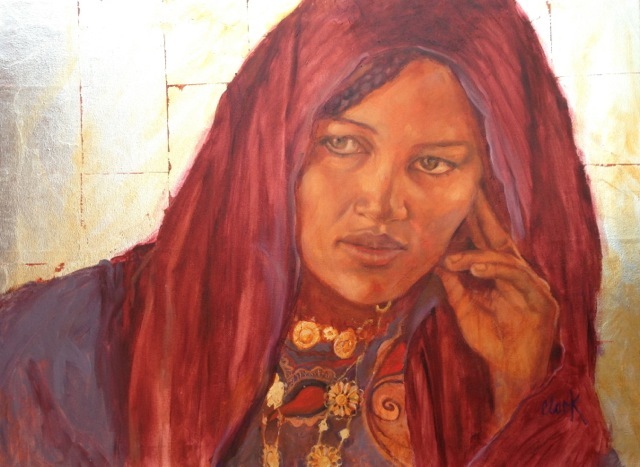 I got to work on paintings, and jewelry and all my meetings came to me. 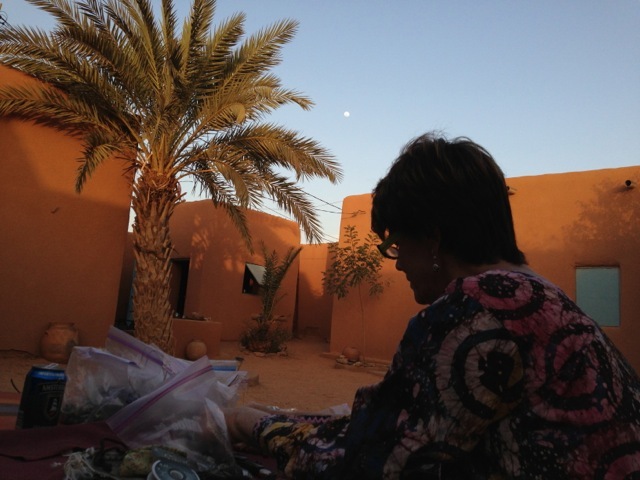 Making jewelry as the moon rises, and with the help of iPod below. Some of the production. 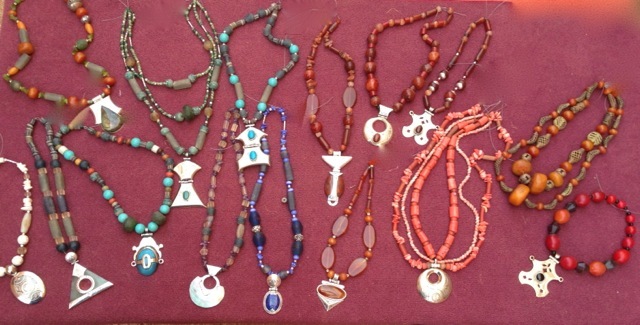 Soon to be on sale at Nomad Gallery–shall I call it the Guantanamo collection?…maybe not. I ate well. 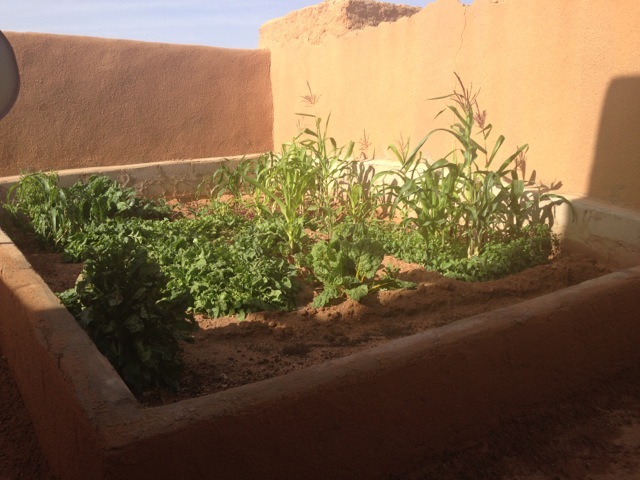 My garden, that Alhassane planted for me/us before my arrival was thriving–arugula in the Sahara–imagine! 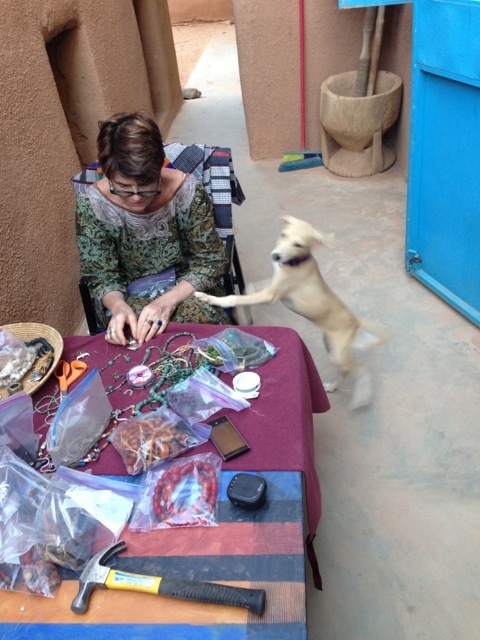 And I got to see old friend who came to visit a stayed for dinner parties–with music. 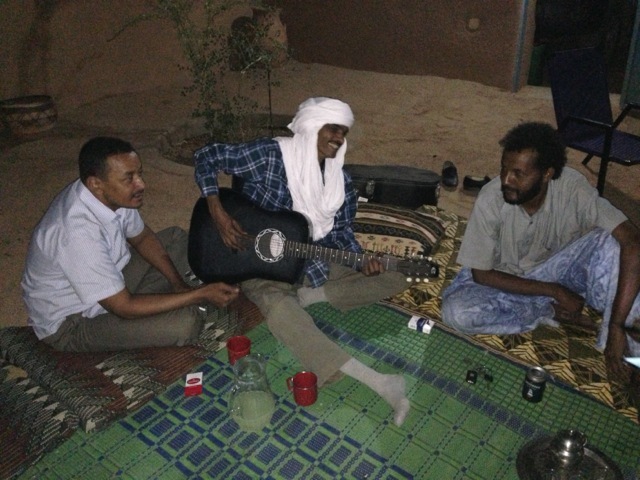 Here Hasso, Abunguel and Alassane–three buddies of the rebellion of the 90’s enjoy a rare reunion. So–I’m having too much fun–better get to work on the projects. Stay tuned. Didn’t realize you COULD keep a low profile! So all my worrying on your last trip was for naught. 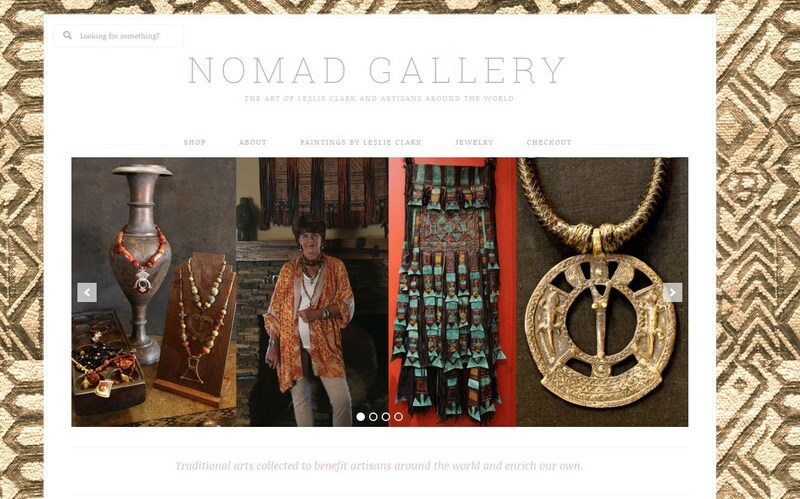 Am so proud of my little sister for all she has accomplished with the Nomad Foundation.